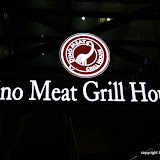 We went to a fun Korean BBQ restaurant tonight called Dino Meat Grill House in “New City” Dongducheon. Honestly, It really should be called Dino-mite meats because it’s absolutely fantastic! We Bee’s give this place two thumbs up! We enjoyed our meal with our two good travel buddies Hector and Doris. We made sure to snap some pictures for our fellow blog followers so that they could partake in the experience as well. Before entering the restaurant you remove your shoes and place them in or around the shoe slots. We were immediately greeted and seated by the host. The seating is quaint and bit different as you sit on a small flat pillow on the floor. Next the server will bring you an array of sides that consist of salads, various sauces, whole garlic cloves, and of course kimchi. Foreigners prep yourself utensils only consist of metal chopsticks and a long handled soupspoon. Next you take your silver tray and head up to the meat buffet. At the meat buffet you are hand selecting your own meats with metal tongs. The meat options consisted of beef ribs, pork galbi, samgyeopsal, sausages, thinly sliced marinated beef (reminding us of chopped cheese steak meat), and meat patties. We have to note again that the meat is seasoned and flavored FANTASTICLLY! Oh and that you can select as much or as little of the meats you want. However we also must inform you that you will be charged if you take meat that you do not eat. This cuts down on people acting solely on eyes and not stomachs. Now it’s time to start up your tables grill. The grill takes about 5 – 10 minutes to get warmed up. This is where we thought it reminded us of the Melting Pot or a Brazilian steakhouse in the states. Each table comes equipped with its own grill. We were able to gather some quick tips from the teens that were grilling and chilling to the left of us. Don’t worry if you get stuck or need some sides replenished, you simply press the “call button” that is located on your table for the wait staff. So how much cabbage is this place going to set you back? Get ready for this…. 14,000 won per person! What a steal for all the meat you can eat! Remember, no tipping, the price you see is the price you pay, end of story. Hey r u in South Korea? Moving to Daejeon on March 5. Yes! I’m located north of Seoul. That’s exciting your getting ready to make the big move here.